FRAMINGHAM, Mass.--(BUSINESS WIRE)--Oct. 29, 2015-- Staples makes chic, fun and functional workspaces happen with new products and designs for Style at Staples, which features the exclusive Cynthia Rowley Collection and unique, home and office items from Paperchase. New from Cynthia Rowley are wallpaper, backpacks, tote bags, lunch bags, phone wristlets, laptop sleeves, flash drives, planners, phone cases and reading glasses. The Style at Staples collections will be available just in time for the holiday gift-giving season beginning November 3 at Staples stores and Staples.com. Exclusive to Staples, the latest Cynthia Rowley Collection features her new designs in eye-catching bold colors and patterns on everything from wallpaper, reading glasses, notebooks, desktop organizers, phone cases to storage boxes, tech cases, backpacks and more. 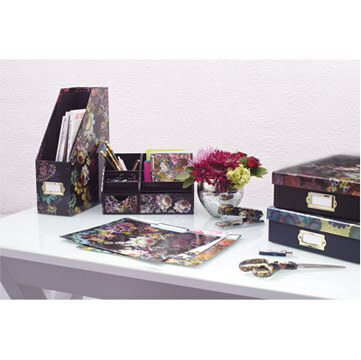 In addition, Staples will offer a new unique collection with original designs from leading London stationary brand, Paperchase. Their in-house design teams have used their distinct talents to create three new lines. All tastes are covered with the new Paperchase lines. For those looking for something dramatic there is the intense floral prints of the Dark Romance collection, while monochrome prints peppered with colorful exotic birds give the Paradiso collection a sophisticated edge. This contrasts with the Get Organized line and its black and white geometric print offset with fresh green accents. Cynthia Rowley is a leading global lifestyle brand sold in over 60-freestanding collection boutiques, as well as in department, specialty, and online stores worldwide. Brimming with energy, Cynthia Rowley imbues a sense of adventure in all of her design projects, be it wetsuits or her ready-to-wear. While attending the Art Institute of Chicago, Rowley fell into fashion when a local department store buyer discovered her on the train. That initial interest gave Cynthia the confidence to move to NYC where she went on to win the CFDA award for best new talent, became a best-selling author and has appeared on TV shows such as Project Runway, Letterman and The Today Show. The Cynthia Rowley brand currently includes sportswear and related accessories with additional categories including swimsuits; wetsuits; beauty; Rowley Eyewear, an ecommerce site featuring eyewear collections for both men and women; and ROWLEY, a recently launched fitness collection. For more information on Cynthia Rowley, visit www.CynthiaRowley.com.